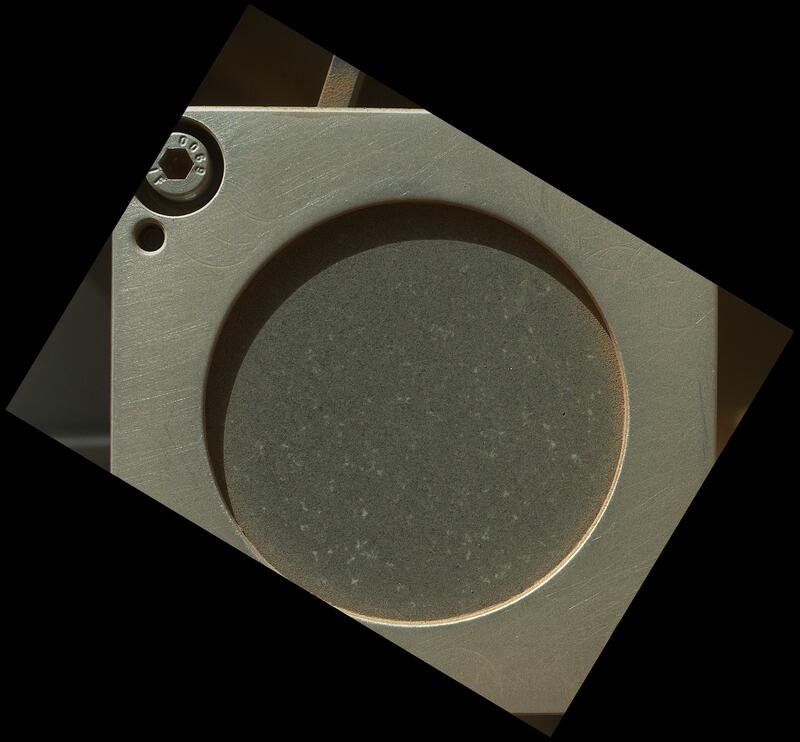 A sample of basaltic rock from a lava flow in New Mexico serves as a calibration target carried on the front of NASA's Mars rover Curiosity for the rover's Canadian-made Alpha Particle X-Ray Spectrometer (APXS) instrument. 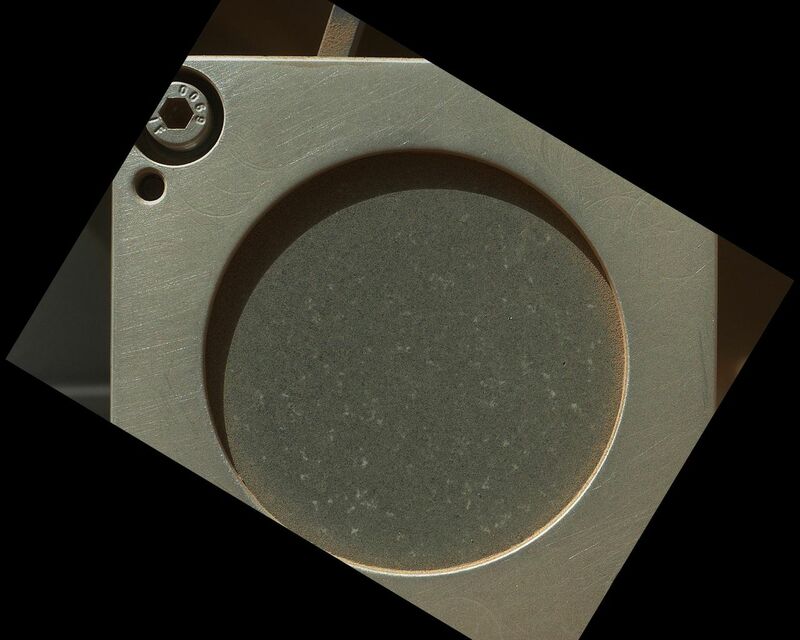 This image of the APXS calibration target was taken by the rover's Mars Hand Lens Imager (MAHLI) during the 34th Martian day, or sol, of Curiosity's work on Mars (Sept. 9, 2012). The image has been rotated to compensate for the tilted orientation of the camera when it was taken. The prepared slab of well-characterized dark rock collected near Socorro, N.M., is held in a nickel mounting. The circular opening revealing the rock is about 1.4 inches (3.5 centimeters) in diameter. The Sol 34 imaging was part of characterization testing of the rover's arm and tools on the arm. A subsequent step commanded the arm-mounted APXS instrument to take a reading of the composition of the calibration target. Curiosity will use the target from time to time during the mission, checking the continuing performance and calibration of the APXS instrument. APXS can identify chemical elements in rocks and soils. The spectrometer uses the radioactive element curium as a source to bombard the target with energetic alpha particles (helium nuclei) and X-rays. This causes each element in the target to emit its own characteristic X-rays, which are then registered by an X-ray detector chip inside the instrument's sensor head. The rock in the calibration target is the hardest basalt of more than 200 types tested by the APXS team. Hardness was a desired attribute for preventing the target from breaking during the stresses of launch and landing. In addition, this basalt is low in sulfur, nickel and chlorine. Those elements are common in Martian dust. 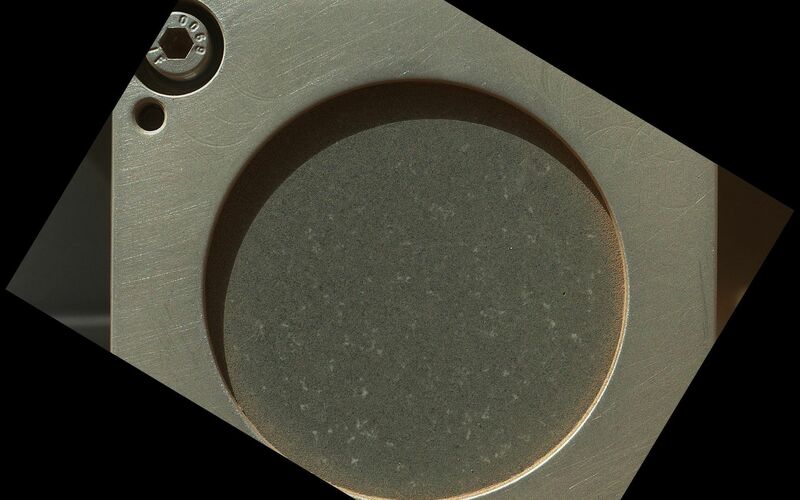 Thus, scientists using APXS will more easily detect and account for any Martian dust on the calibration target.